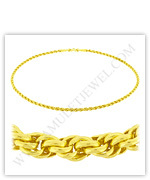 Thin and thick gold rope chain necklace jewelry in this category is ordered from low prices to high prices. You can simply click on the links or images below for more detail of each item. We offer you a 30-day return guarantee, a lifetime guarantee, and a low price guarantee for all items. Thin and thick gold rope chain necklaces are below.